I received a request for a bell chart for I Often Go Walking to sing for Mother's Day. You can find my lesson plan for this song HERE. I usually don't have the handbells play the melody (mostly because it makes for really long bell charts) and since this song doesn't have a descant or obbligato, using chording is a great way to go! You can find my chart HERE. The writing down the left side are the chord names to be played (they are found in the music above the notes on the top hand). Then on the right side I tried to write in the portion of the word where the bells come in. For the introduction (where there are no words) I wrote "intro" and the count they come in on, either count 1 or count 3. I hope that makes sense. If you are unfamilar with using handbells in primary, check out my post HERE. Handbells using chording is pretty technical so if you are new with bells, I'd hold off on using chords for a bit. 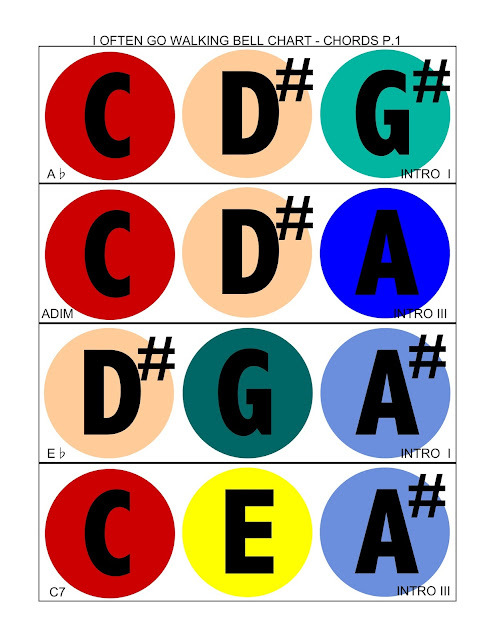 If you'd like to make your own handbell chart using chords, check out my post HERE. It's similar to my make-your-own-handbell chart found HERE but I've done the hard part by putting all the chords together. You made my week! THANK YOU so much for the bell chart for "I Often Go Walking." This helps me TREMENDOUSLY, and my kids are going to be so thrilled to learn their first song with chords and the chromatic bells!! I asked them last Singing Time if they wanted to take a break from the bells for a bit, or if they wanted to continue with the bells, and they all cried with one accord, "we want more bells!" Thanks again for all your help, and I can't wait for your make your own chord bell chart post! You truly are such a gem and a true inspiration. Thank you from the bottom of my heart! Our primary pianist recently told me that they used to have a hard time getting the kids engaged and singing, but now with the bells they are totally into Singing Time, thanks to you and your blog about hand bells! thank you for the bell chart. it is so cool. thank for teaching us how to make them. Thank you soooo much! This is a lot of work, we so appreciate it! Sorry if this is obvious. How to you know which red bell to play? I just always pass out all the colors and the kids play all the octaves. So I don't worry about which red bell is being played. It gives more kids a chance to play.